This paper applies the concept of diaspora to the analysis of the creation and maintenance of an ethnically diverse community of internationally educated medical graduates residing in Canada. Traditionally, the research on diaspora concerns ethnic communities that preserve their homeland ties while residing in foreign countries. We suggest, however, that ethnic roots are not imperative for the analysis of diasporic communities when other forms of shared values and meanings can become a basis for creation of collective identity. Reconfiguring both the homeland and host country as places of geographical and professional belonging provides opportunity to conceptualize an ethnically diverse group of immigrant physicians residing in Canada as professional diaspora. Probing the interviews with 67 international medical graduates living in Canada, we demonstrate (1) how they create medical diaspora, (2) what myths and sensitivities they share in constructing their professional and/or geographic homelands, and (3) the relationship they develop with their hosting society. 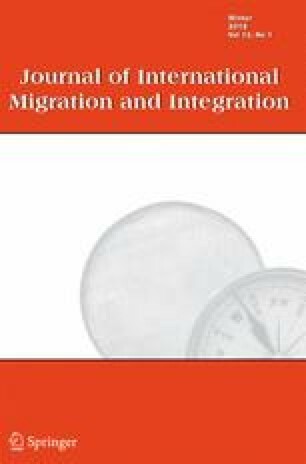 We suggest that in spite of the increasing mobility of internationally educated health care providers, the analysis of professional diasporas could become a useful tool for analyzing complex relationships between home countries, hosting countries, and international travelers. The funding for the research this paper is based upon was provided through a Standard Operating Grant from the Social Sciences and Humanities Research Council of Canada entitled, “BRAIN DRAIN, BRAIN GAIN OR BRAIN WASTE: An Examination of Health Providers who Migrate to Canada” awarded to I. Bourgeault and V. Satzewich. We would also like to thank Jane LeBrun, Ken Viers, and Judi Winkup for assisting in collecting data for this research project. Bourgeault, I.L., Neiterman, E., LeBrun, J., Viers, K., & Winkup, J. (2010). Brain gain, drain & waste: The experiences of internationally educated health professionals in Canada. Ottawa: University of Ottawa. Available at: http://healthworkermigration.com/resources/iehp-report.html. CARMS (2008). Canadian resident matching service. Reports & statistics http://www.carms.ca/eng/operations_R1reports_08_e.shtml. Accessed June 03, 2008 2008. Dumont, J.C., Zurn, P., Chruch, J. & Le Thi, C. (2008). International mobility of health professionals and health workforce management in Canada: myths and realities. OECD Health Working Paper, 40. Retrieved from the World Health Organization Website: http://www.oecd.org/dataoecd/7/59/41590427.pdf.